This is a basic 1870s corset, made to go under my Victorian bustle gowns. For my very first corset, I didn’t want to do a lot of modifications, so it’s pretty straightforward. I only adjusted it for fit. 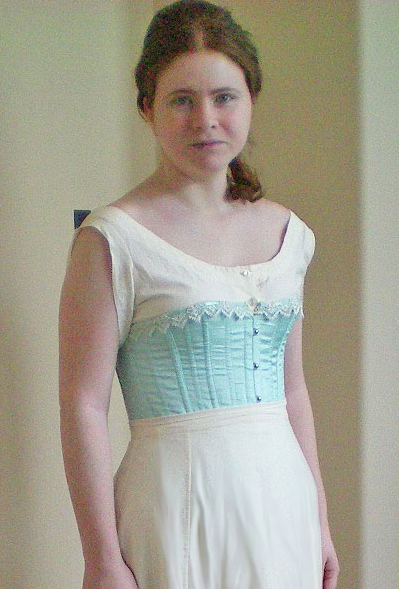 I’d already decided that I wanted my corset to match my combinations and petticoat, which were white with pale aqua accents. I found a gorgeous aqua silk habotai from a seller on eBay, and bought a yard, which proved more than enough. I lined the corset with ivory sateen, interlined it with a sturdy twill, and trimmed it with ivory Venetian lace and aqua ribbon. 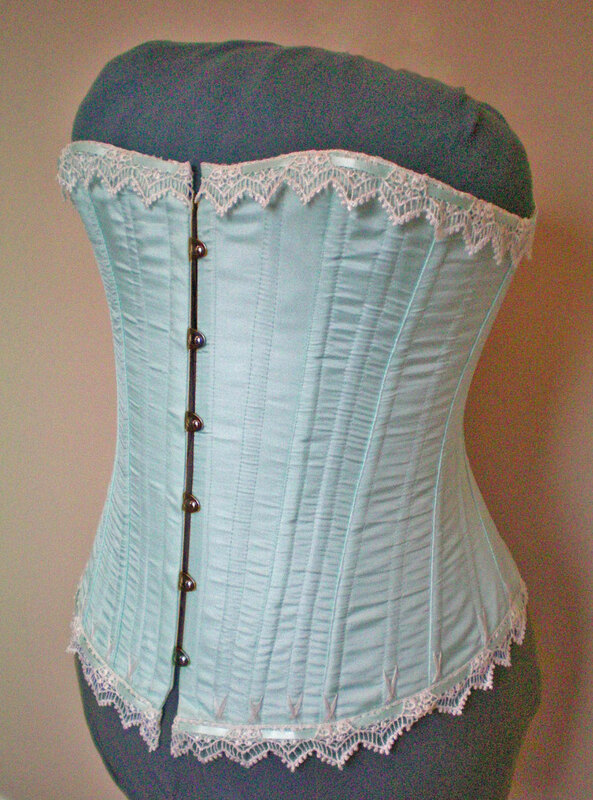 I used spiral steel boning and a heavy-duty busk, which I salvaged from a custom-made corset that no longer fit. I love the directions given by Truly Victorian. It made assembling the corset so easy—I will definitely use the TV110 pattern again! Unfortunately, I didn’t take any photos while I was sewing the corset, so I have no in-progress pics. I also didn’t take any notes, so this diary is lamentably short. I can describe it for you, though. 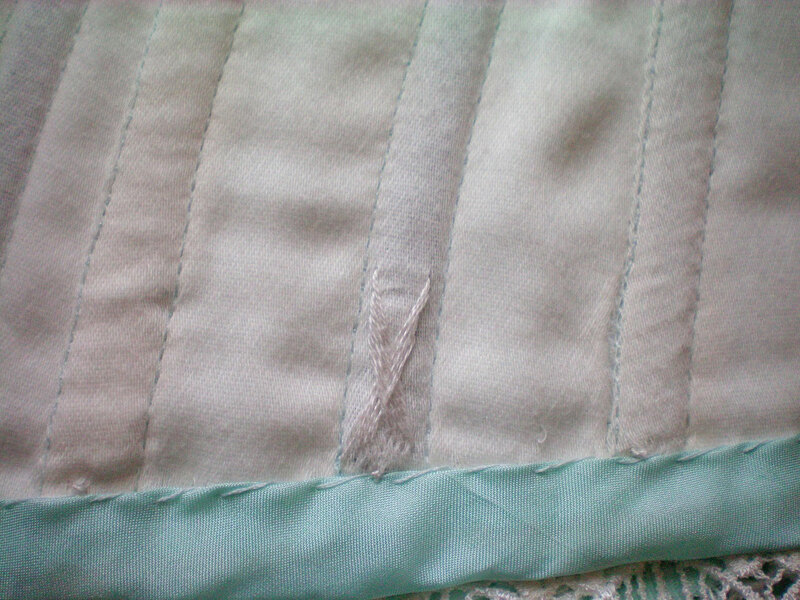 The corset is lined with sateen, and the bones are sandwiched between the inner and outer layers, giving the corset a clean, finished appearance. I’d heard that the more boning you use, the more comfortable and effective the corset is, so I added boning to every seam, plus an additional bone halfway in between each seam. There’s no more than an inch or two between each bone, and I found that this works quite well. For the back closure, I used silver-toned grommets. They were simple to install using a metal die and a rubber mallet. I considered lacing bones, but in the end decided against them. I was worried they’d be too stiff, forcing my back into a stricter posture than would be comfortable. Instead of the lacing bones, I placed boning on either side of the grommets, to stabilize them. Once the corset was finished, I set about trimming it. 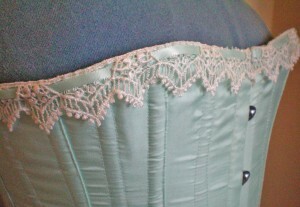 I wanted to floss this corset, so I used ivory embroidery thread and a basic flossing pattern. Flossing adds a decorative touch, but it also helps secure the bones in their channels. I placed additional flossing on some of the interior boning channels, as well. 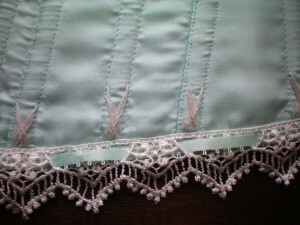 Many extant corsets are decorated with lace, so I added a scalloped Venetian lace to the top and bottom edges of the corset—the same lace as on my evening combinations, so the two coordinate with each other. After stitching the lace on, I wove an aqua satin ribbon through the upper edge. Initially, the idea of making my own corset scared me to death. I saw it as the ultimate challenge and put it off for more than two years because I was terrified. It turned out, however, to be quite easy! I definitely plan on making another Victorian corset using this pattern, and sooner rather than later, as my recent weight loss has rendered this corset too big. 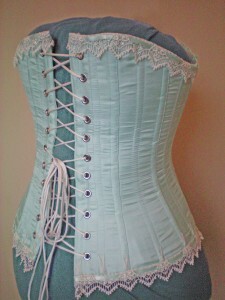 That corset is stunning, I really love the colour of it and the pretty lace trim. Your site is packed with great tutorials and lovely projects. I’m so glad I found it. Thank you! 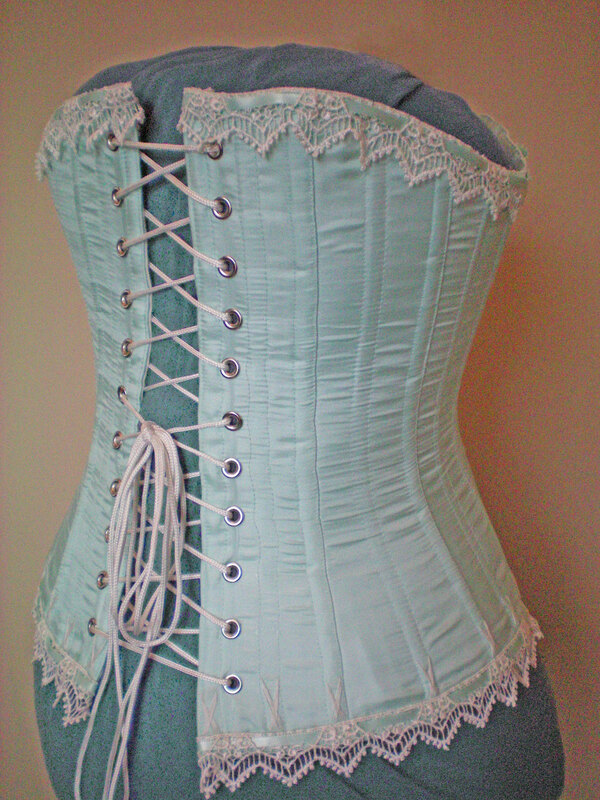 Of all the corsets I’ve made, this one is my favorite. I’m glad you’re enjoying my site!